It is a real pleasure for me to join you again at the Chinese New Year dinner. I want to thank the 48 Group Club for organizing this event. It has gathered us in celebration of the most important traditional festival in China. This means we will wave off an old year and welcome in a new one. Looking back on the outgoing year of the Dragon, both China and Britain went through significant and joyous events. Here in Britain the Diamond Jubilee and spectacular Olympics made the UK the focus of world attention. Britain surely has every reason to be proud. While half a world away in China, the most significant event last year was without doubt the 18th Congress of the Communist Party. I believe there may soon be a new English abbreviation or acronym. This will be 'EPC' to describe the 18th Party Congress because in the coming five years, and even beyond, no talk of China will go without the mention of the EPC. · Double GDP and per capita income by 2020 on the basis of 2010 level. · Build China into a well-off society by 2020. · Realise revitalisation of the Chinese nation by building China into a socialist modern country that is rich, strong, democratic, culturally advanced and harmonious by the middle of this century. · China will deepen reform and opening up with greater courage and wisdom. · China will redouble its efforts to promote economic and social sustainable development. · China will go all out to make sure that development is for the people, by the people and of the people. After reviewing developments on our respective domestic fronts, we should now take stock of relations between us. China-UK relations last year was not a straightforward story. There were both ups and downs. Let me first take you through the 'ups'. We felt the strong desire of our peoples for China-UK friendship. In particular, business, educational and cultural communities of our two countries greatly drove forward our cooperation in a rich gamut of areas. This was the highlight of China-UK relations in 2012. · Thanks to the joint efforts of Chinese and British business communities, our bilateral trade hit a new high last year. · Britain became the only member of the EU that had positive growth in both exports to and imports from China. 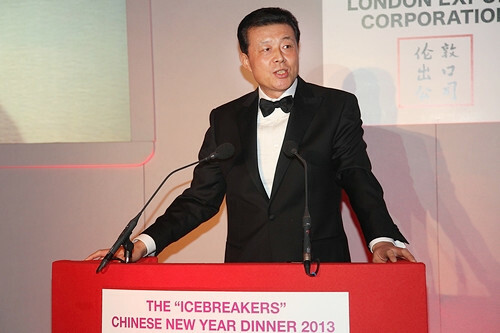 · Chinese investments in Britain picked up speed. · Investments last year alone passed the total of several previous years. 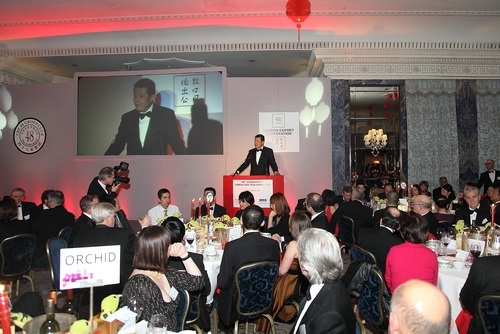 · Chinese students continued to be the largest foreign student community in Britain. · The number of British students in China also created a new record of 4250 last year. · The number of Confucius Institutes and Confucius Classrooms in Britain increased to 23 and 66 last year, consolidating Britain's number one place in Europe. 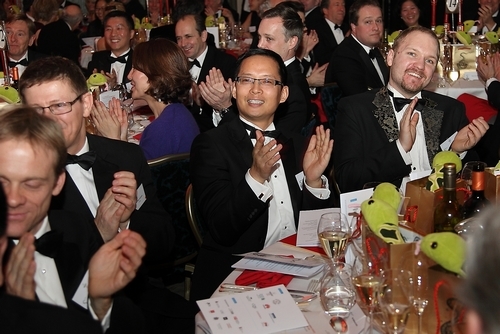 · At the annual dinner of the Russell Group of leading universities last year, I was the only foreign ambassador. This shows a shared aspiration British universities have for exchanges and cooperation with China. · Last year I attended and addressed more than 20 events of cultural exchanges. · The Chinese version of the musical Cats staged in China. · Then there was the English version of the centuries-old Chinese play, The Orphan of Zhao, entertaining audiences in British theatres. · Last year as part of Cultural Olympiad London 2012 the National Theatre of China staged for the first time the Chinese version of Shakespeare's history play Richard III at the Globe Theatre. It was just a few days ago that British archeologists had miraculously discovered the remains of Richard III beneath a Leicester car park. A 500-year mystery has been unraveled. What a coincidence! However, there were also some 'downs' in our relations that we did not want to see. This cautions us that China-UK political mutual trust is far from satisfactory. If not properly managed, our differences will stand in the way of our cooperation. Ensuring stable and healthy development of China-UK relations remains a daunting challenge for us. We heard louder calls from the public for more exchanges and cooperation between China and Britain. Some British economists warned Britain not to miss out the opportunity of China's development. They suggested deepening economic cooperation with China. Some British business leaders raised questions about Britain's visa policies towards China. They argued that the too rigorous policies and complicated procedures stopped Chinese investors and frightened away Chinese tourists. These voices represented the opinion of the general public. These voices are what we need in China-UK relations. As we welcome the new year of the Snake, we are full of hope. We hope that in the New Year China-UK relations will break the old and embrace the new. There is an expression very popular in China these days. This expression is 'positive energy'. It is a term from physics. It did not become well known until the publication of British psychologist Richard Wiseman's book 'Rip It Up.' This is a bestseller on self-help. The book compares the human body to an energy field. Through unleashing potential and activating positive energy one can refresh and renovate himself. In its Chinese translation this book is directly entitled 'Positive Energy'. In my view China-UK relations is also an energy field with enormous untapped potentials. Our job is to fully tap the potential of our cooperation. In turn, we can work together the positive energy of our relationship so that it can achieve greater progress. To this end we need to stress equality and mutual trust. Equality and mutual trust is the foundation for developing state-to-state relations. It is also the very source for the potential of our cooperation and positive energy in our relations. The experience of China-UK relations over the past four decades shows that as long as we respect each other and treat each other as equals, China-UK relations will keep moving forward. Otherwise, China-UK relations will suffer. · We do not need to judge which one is better. · We need to compare which one is more suitable. · We should not repel each other's strengths. · We should draw upon them through closer exchanges and dialogue and through mutual learning. All I say is we need to strengthen our win-win cooperation. China and UK share broad common interests and have ample space for cooperation. The unstable world calls for China and UK to work together on major international issues. Our trade should not be just 0.4% of GDP. Our mutual investment should not be merely tens of billions of US dollars. We are well positioned to accomplish some 'flagship projects' in finance, infrastructure, creative industry and life science. We have every condition to pull off more 'signature' projects in culture, education, science and technology and environmental protection. We will soon meet another year of the Snake. Six decades ago also in a year of the Snake, a delegation of British pioneering leaders launched an 'icebreaking' trip to China. This brave move opened the door of China-UK trade. 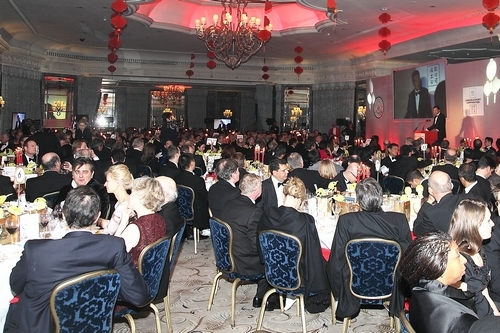 Over the six decades the 48 Group Club has always been the 'positive energy' in China-UK relations. In the Chinese culture the Snake symbolizes prosperity and good fortune. I hope in this auspicious year, the 48 Group Club and friends from across all sectors in Britain will carry on the icebreaker spirit, use your positive energy and write new chapters in China-UK relations. · To the new progress of China-UK relations in the New Year. · To the long and strong friendship between Chinese and British people. · To the health of all present.